Are you thinking about your holiday preparations yet and … what can I sew or quilt to make my holidays easier and fun? 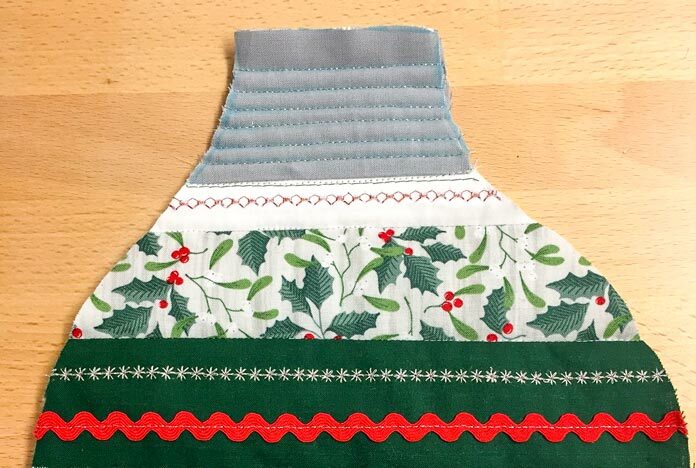 This week I’ll be showing you How to Make Your Holidays “Sew” Much Easier. 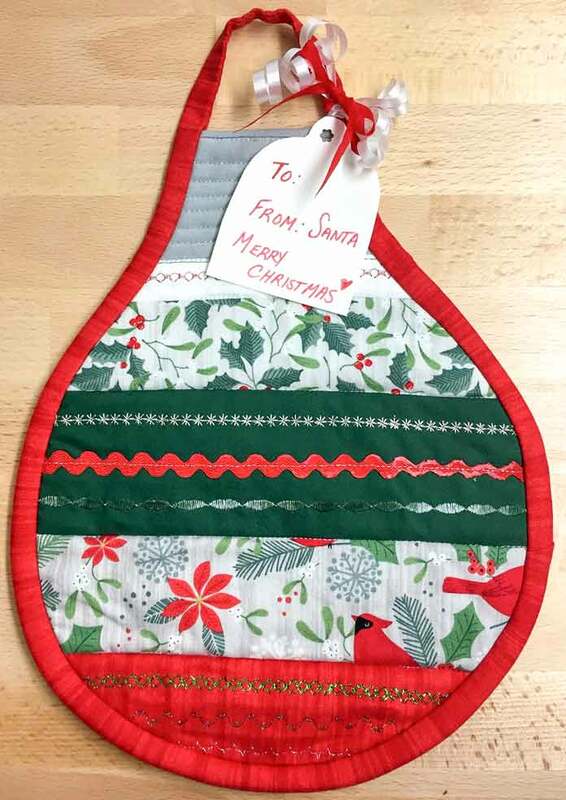 The content will include creative gift ideas for all ages and festive decor using Gütermann Dekor Rayon and Dekor Metallic threads, Therm Fleece,HeatnBond Light Weight Fusible Interfacing, UNIQUE Wash-out Marker and UNIQUE Rick Rack. 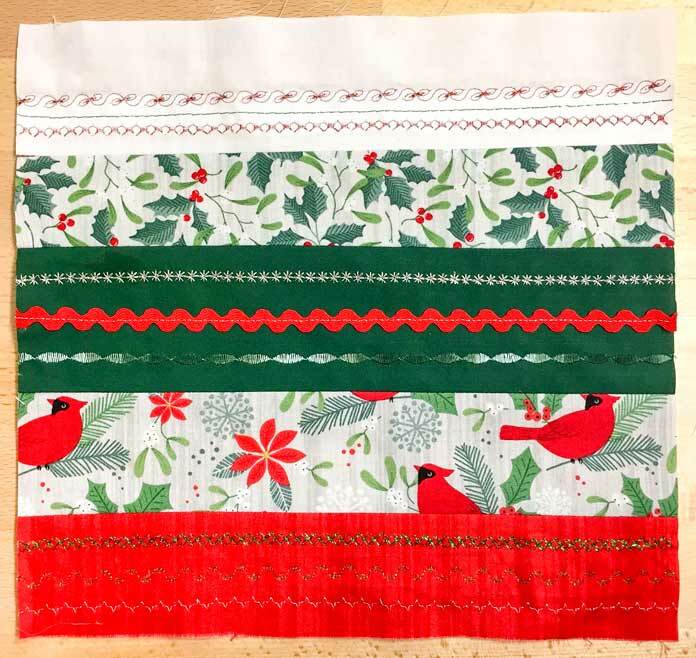 Be sure to check QUILTsocial daily all this week to see what exciting new ideas we have just for you to make your holidays “sew” easy. Spending time in the kitchen during the holidays is a tradition almost every family enjoys, so why not have it looking festive? 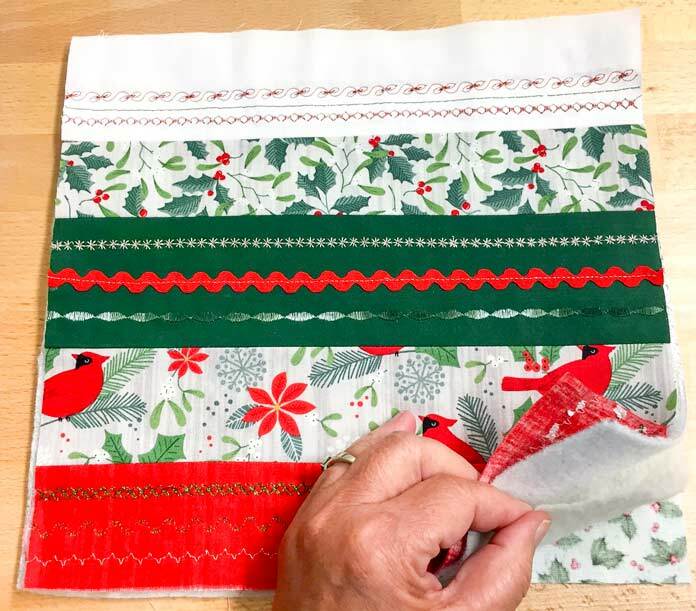 Today I’ll share 2 projects that are a combination of useful, holiday decor and/or simple gifts for friends, neighbors’, coworkers and hostesses. Let’s get started with Mini Microwave Mitts. Often we’re taking a smaller dish out of the microwave and these items can be very hot. 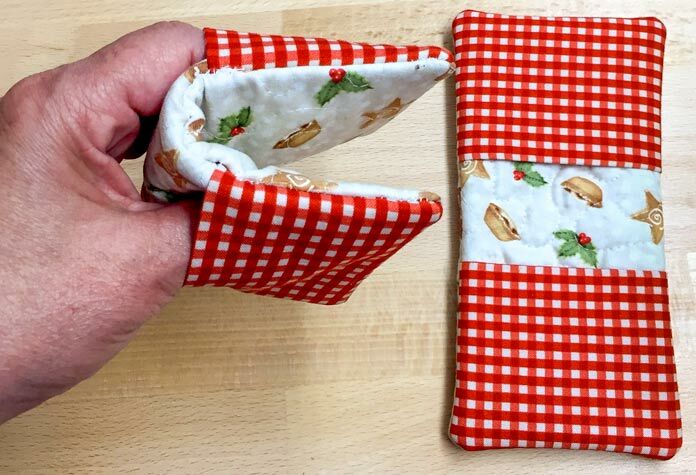 This microwave mitt project will prevent you from burning your fingers and will also look great sitting near your microwave, an added bonus as they take up very little space. 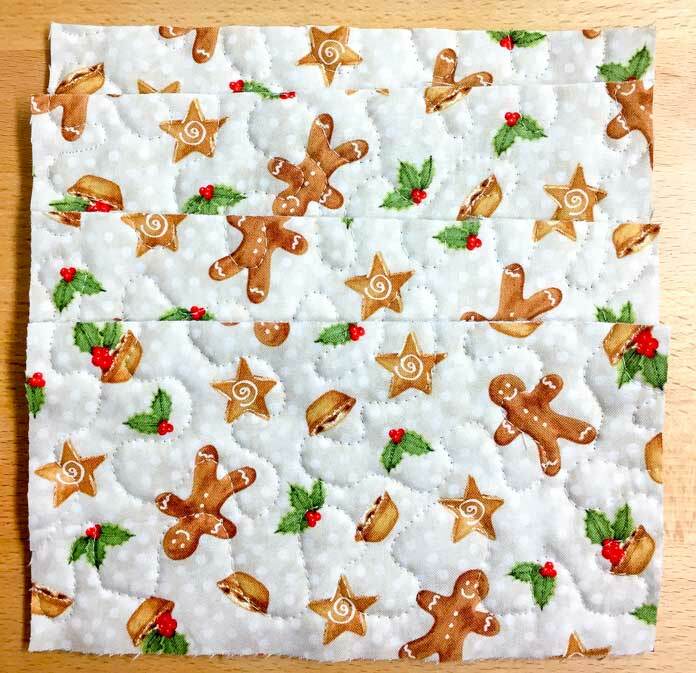 Time to use some gorgeous Christmas fabric! 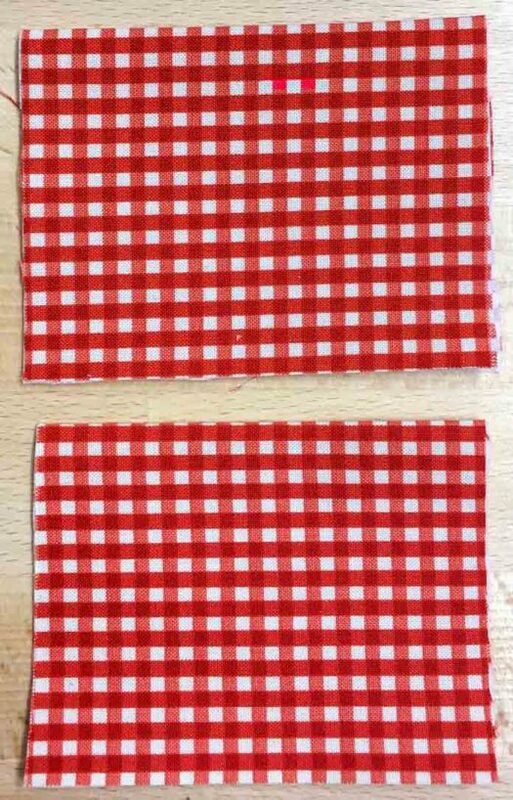 Pictured is fabric from Northcott Sugar & SpiceHoliday Collection and it’s trimmed with the red gingham also from this collection. Essential in this project (and many more) is Therm Fleece from UNIQUE Quilting as it acts as a thermal layer to keep the heat away from your tender fingertips. 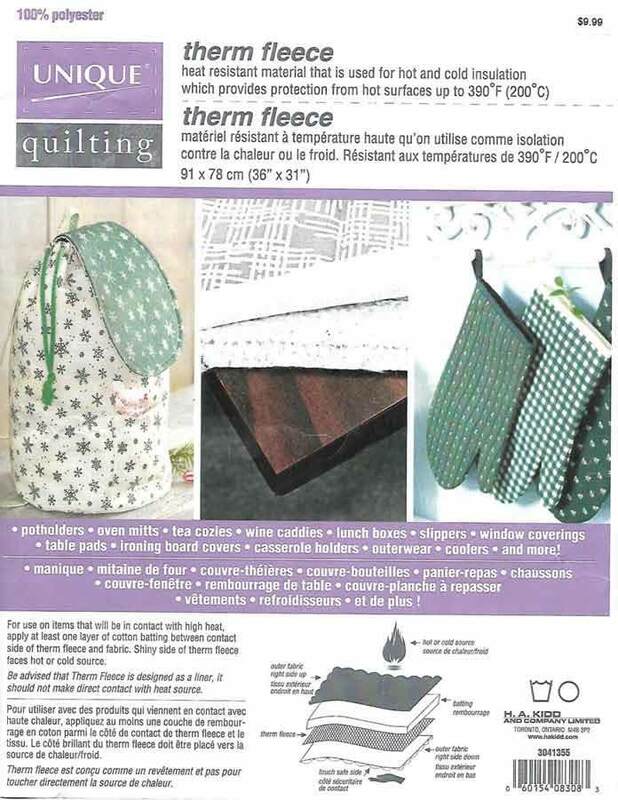 Iron the HeatnBond Interfacing with fusible side to the wrong side of your 4 pocket fabric pieces. 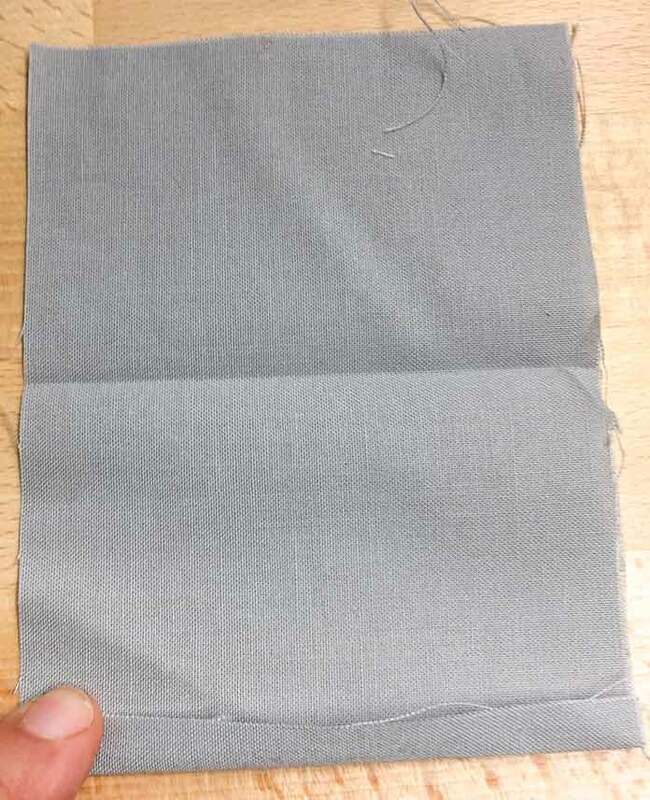 Fold and press in half each interfaced hand pocket piece wrong sides together along the length and set aside. Pin Therm Fleece to the wrong side of your 4 main fabric pieces, the metallic side should face toward the fabric. Quilt through the Therm Fleece and main layers with a walking or free motion foot. Square these 4 main pieces to 7½” x 4″. 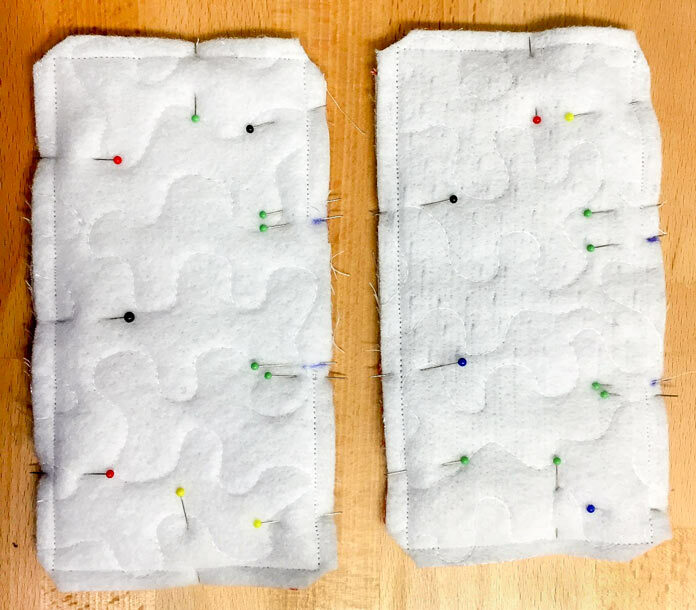 Pin the raw edges of the hand pocket pieces to the 4” end of 2 of the quilted main pieces, you will have 2 other main pieces and they’re now the backs of the mitts. Baste ⅛” around the raw edges of the hand pockets, removing pins as you sew. Place your back pieces right side down on top of the pocketed front pieces and pin leaving a 2” opening for turning. Sew around the perimeter of your mitts using a walking foot and a ¼” seam allowance, do not sew in the 2” opening. Remove pins, clip corners and turn to the right side through the gap, sew the gap closed with hand stitching. Admire your efforts! These take very little time, great for small gifts, stocking stuffers etc. 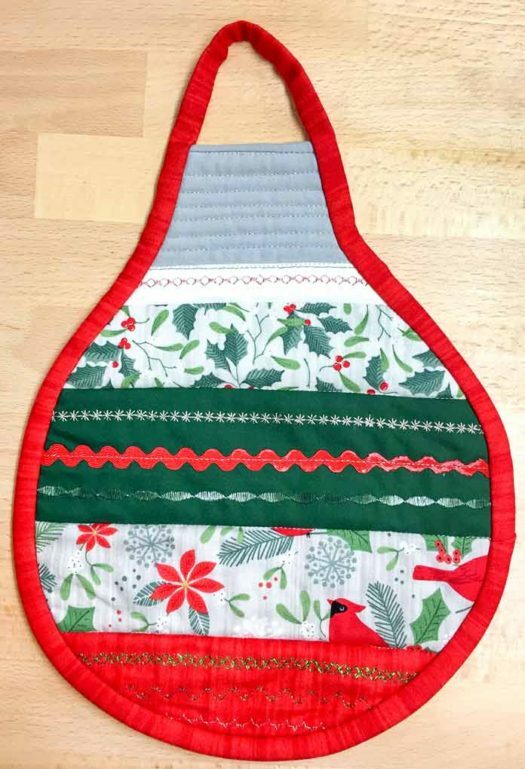 Another great holiday kitchen decor idea with useful appeal…An Ornament Hot Pad with recipe pocket. 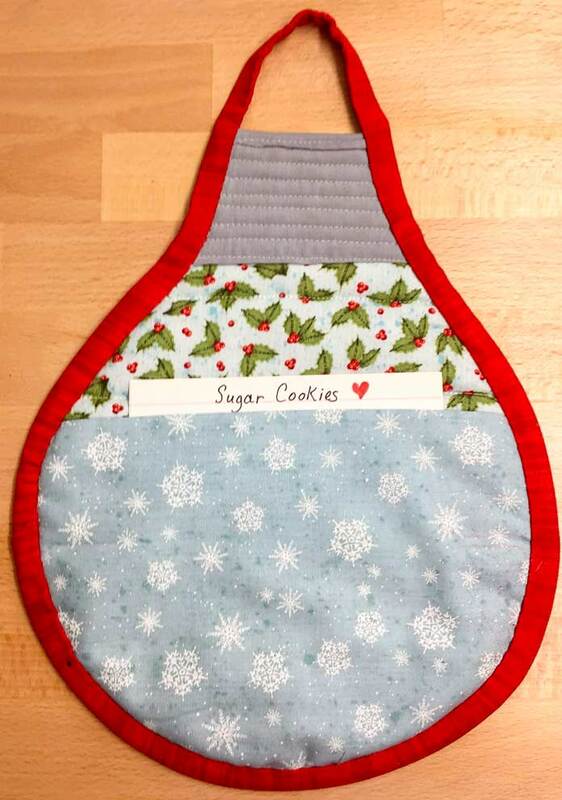 Place your favorite recipe in the pocket on the back and give it to your holiday hostesses this year. 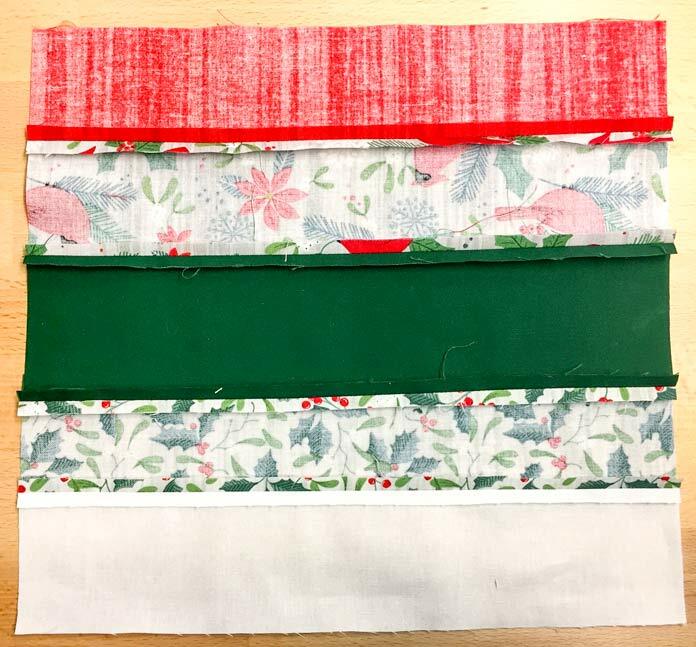 Sew all of your beautiful fabric strips together and measure to make sure there is 12” in width when complete, press seams open. Cut a piece from the strip set 10″ x12”, you can save any of the remaining strip set for more hot pads. Decorate the right side with Decorative & Metallic Threads, Embroidery Machine Needles, Rick Rack and decorative stitches. 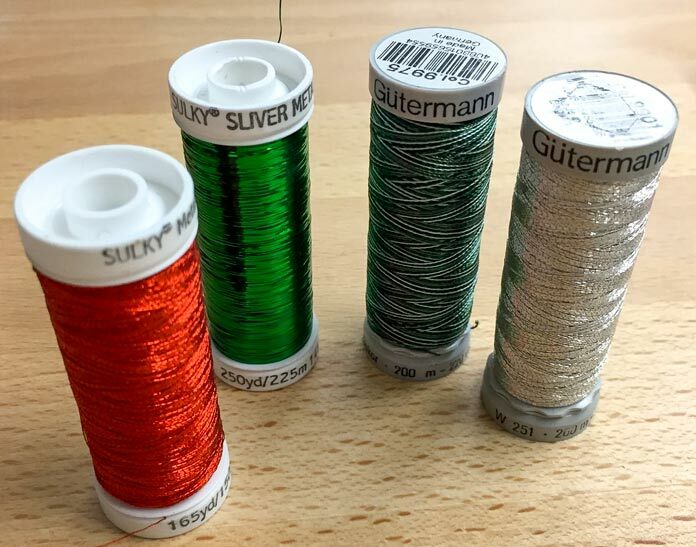 This is a great time to “audition” the decorative stitches on your sewing machine. Iron your back pocket piece wrong sides together in ½ along the 12” length and press so there is a crisp fold, set aside. 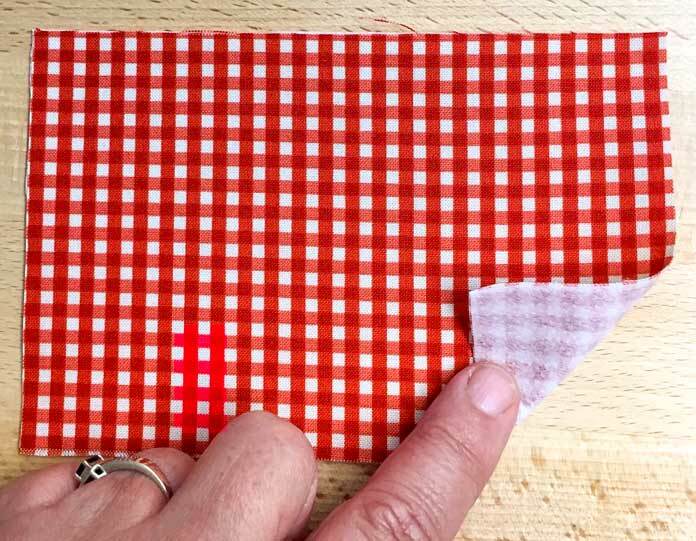 Prepare binding fabric as you would for a quilt by folding wrong sides together along the length and press, set aside. 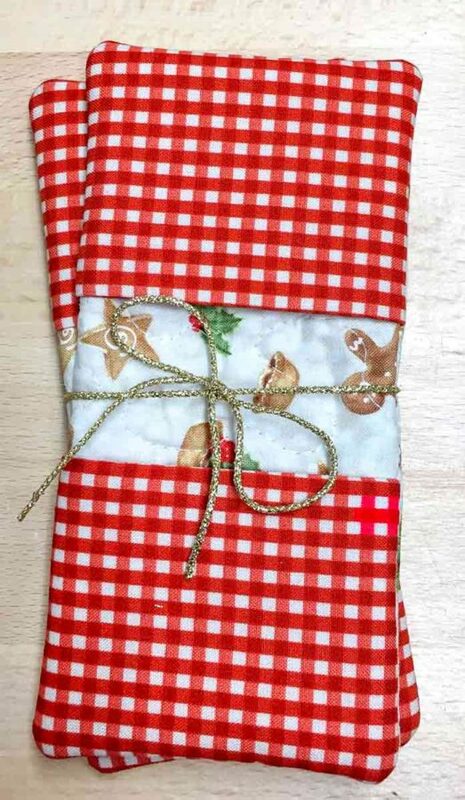 Make a quilt sandwich by placing 4 layers together, the back piece right side down, wrong side facing up, batting on top, Therm Fleece placed on top (metallic side facing up) and then your strip set on top, right side facing up. Pin and quilt through all layers with a walking or free motion foot. Using the free pattern download provided here, cut out your pattern and lay it on your quilt sandwich, mark your sandwich along the lines of the pattern with a Unique Wash Out Marker and cut out all layers with scissors. Iron one 4” edge of your grey fabric (for ornament hanger) under ¼”. Measure and mark the center of the quilt sandwich at the top and mark 2½” down from center with your wash-out marker. 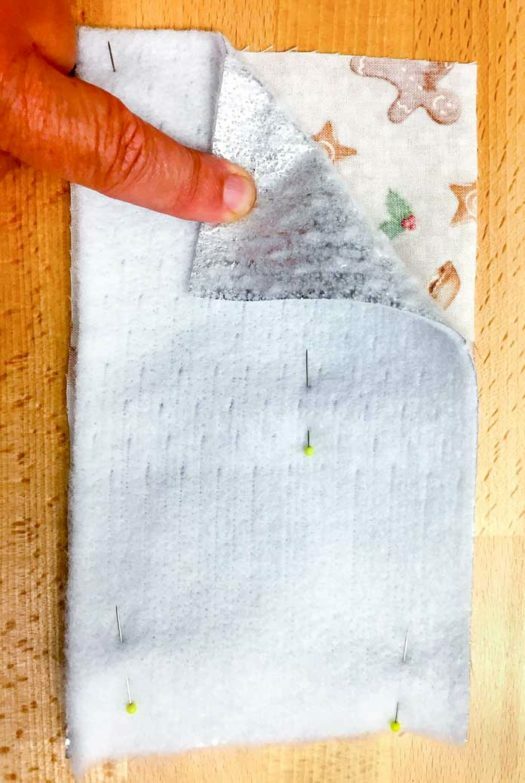 Lay the raw edge of the 4” side of the grey fabric on the 2½” mark you just made, pin, sew along the 4” length and flip to the back side of the quilt sandwich. 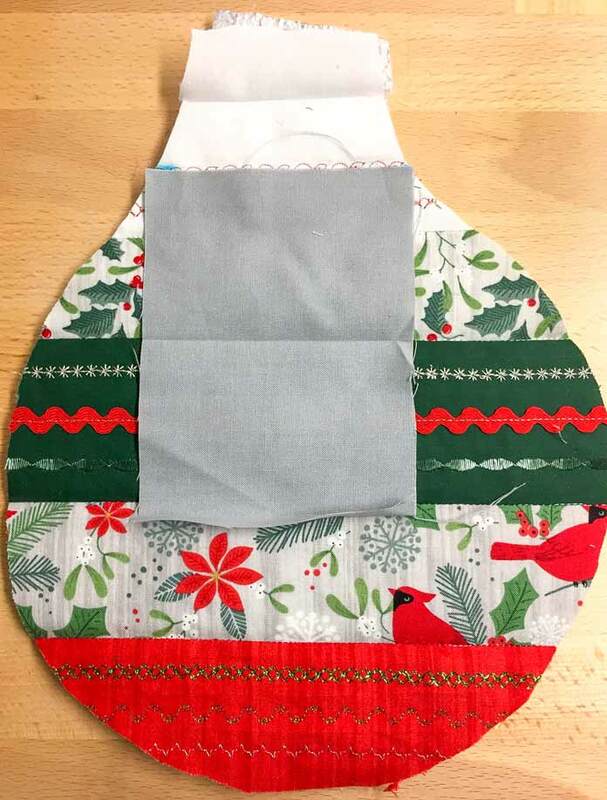 Press the grey to the backside and sew a discrete line of sewing on the ¼” folded side on the back of the hot pad, you may also wish to quilt the ornament hanger. 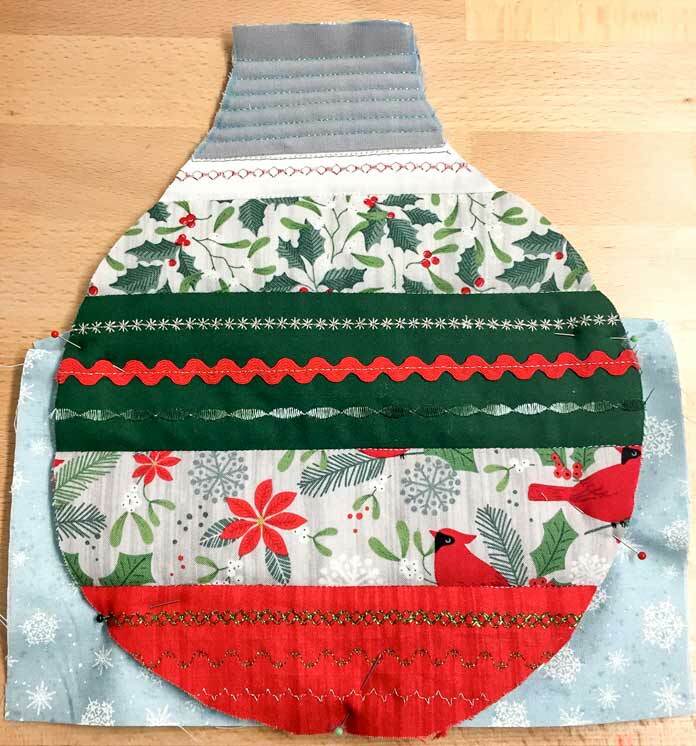 Baste your pocket piece to the back of the quilted ornament with a ⅛” seam allowance and fold placed towards the center back, match bottom edges and cut out even with the ornament front. 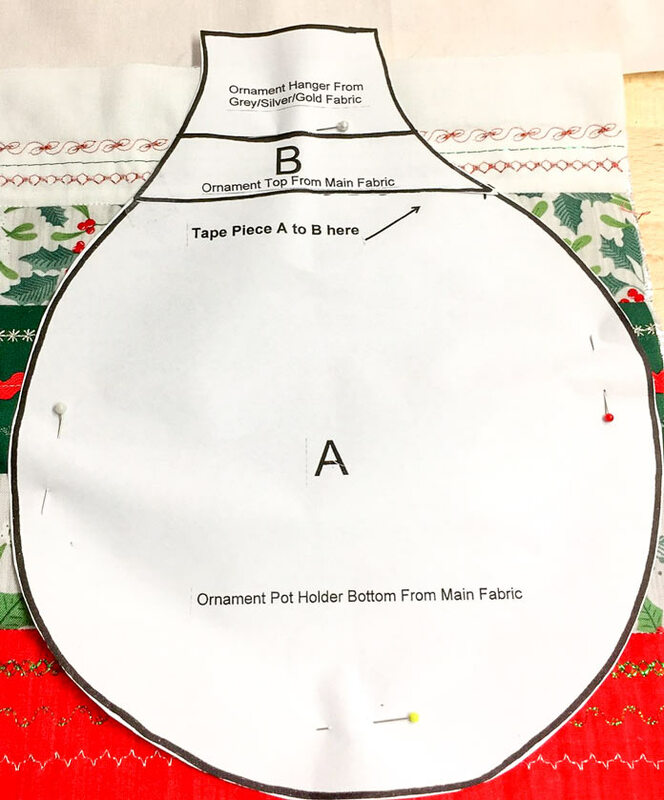 Once cut out, bind the ornament as you would a quilt. 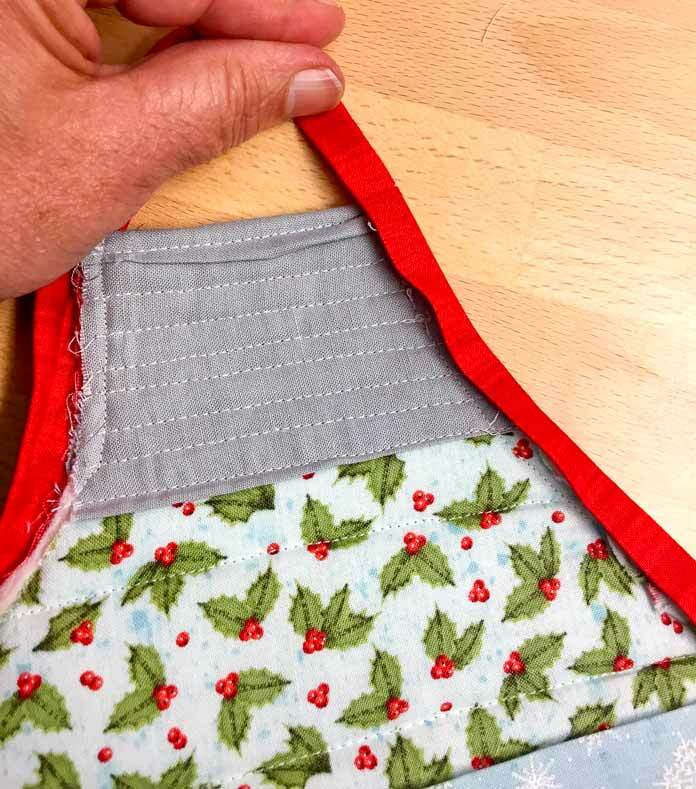 It’s recommended to sew the binding on the right side of the ornament by machine, stop at the left top of the grey fabric and leave a 5” loop of binding fabric. Resume sewing on the right top side of the grey fabric and complete the sewing of the binding as you would for a quilt. Refer to photo. Press and hand sew the binding on the back of the ornament and at the 5” loop section. Fold the 5” loop section to look like the binding. Refer to photo. Place a favorite recipe in the pocket on the back. Place a favorite recipe in the pocket on the back of the ornament. We all enjoy favorite Holiday Cookie recipes! Admire your efforts, it’s ready for holiday decor, gift giving and for the cooks/chefs in your life! Join me tomorrow, I’ll show you how easy it is to sew with felt and to make a “sew” easy gift for a toddler and the adults in your life. 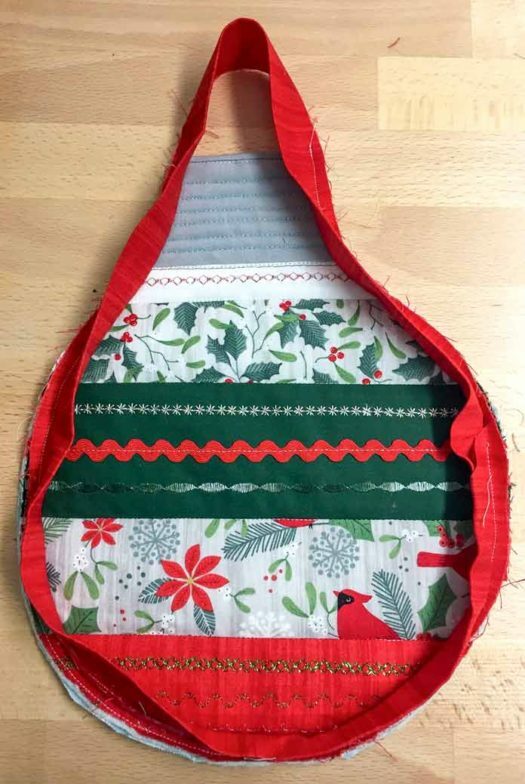 Also, please feel free to comment below and share your “Sew” Easy Holiday Gift Ideas. 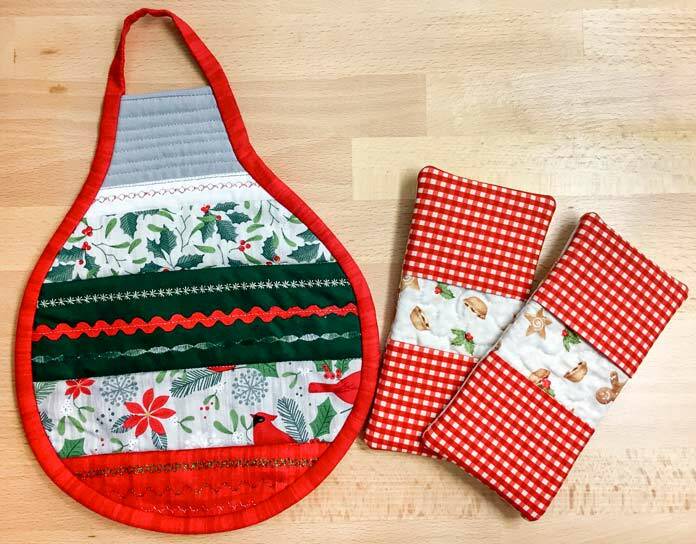 Thanks Kathy, show us your hostess gifts once you have them done, so much fun to see what others are working on for the holidays! Love the microwave mitts. I have some pot lids with metal knobs on top that burn my fingers every time. Think I’ll make these and put them to dual use. Some fantastic ideas here, thanks so much for sharing with us. Thank you for clear directions! I need new holiday kitchen decorations. These are fun AND functional! I love making holiday gifts for my neighbors. It’s not expensive and it comes from the heart. That’s the whole idea Cathy, I have made the Ornament Pot Holders for Neighbours before. They are easy and fun and once you have a strip set made, you can make many at once. Enjoy!